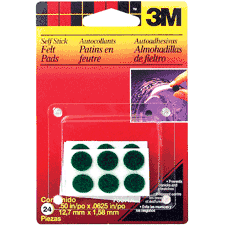 Home > Home Decor & Housewares > Good Housekeeping > Self-Stick Felt Pads 0.5"
24 Green Pads. For vases, figurines, lamps and so forth. Help prevent damage to finished surfaces. 0.5 in by 0.0625 in.